Together with your child and under the guidance of our expert chefs you will create a meal for you both to savour and enjoy in our spacious dining area. Our 90min kids and parents classes, for 8-11 year olds, are a great way to introduce your children to the joys of cooking and create a meal for you both together. With our chefs, you’ll really help them to flourish in the kitchen. We have created fantastic recipes designed to appeal to young taste buds that are seasonal, easy to prepare and, most importantly, delicious! Please note booking one ticket (£58) covers a place for you plus one age appropriate child. If you, or your child, have any allergies or dietary requirements please call us in advance to check if the menu is appropriate. We will always try to cater for dietary requirements where we can. Make sure that you arrive 10 minutes before the start of the class. This will allow you both to get ready, wash your hands, have a look around our shop and meet your chef! *One ticket (£58) covers a place for one adult plus one age appropriate child. *The maximum number of children per adult is one child. *Each parent and child will be provided one chopping board to work from together. *If you want to bring an additional child they will need to be accompanied by another adult. 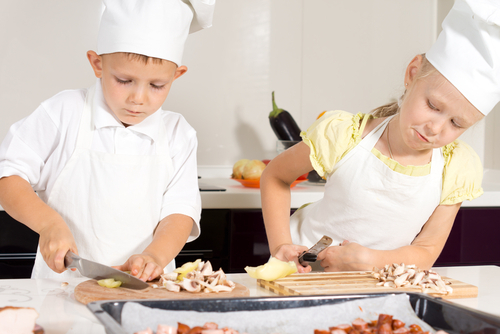 *Kids and parents cooking classes run during certain school holidays and at selected times. *Children must be aged between 8 and 11 and must be accompanied by an adult. *Classes are capped 6 duo tickets i.e. 6 parents and 6 children maximum. *Child & Parent classes can only be purchased by cash, debit/credit card or L’atelier des Chefs Gift card.